This site is dedicated to Orcas around the globe, free, captive, alive or deceased. The site has been made in dedication to all those individual orcas that have suffered in the hands of man or still are suffering. Those gone will not be forgotten. We will try to update this page as often as possible so check back soon! 09/02/03 - Kalina has given birth!!! Check out the News section for more info! 05/01/04 - It is official! Sharkane is pragnant and due in June of this year! 12/12/03 - Keiko has died in Norway. 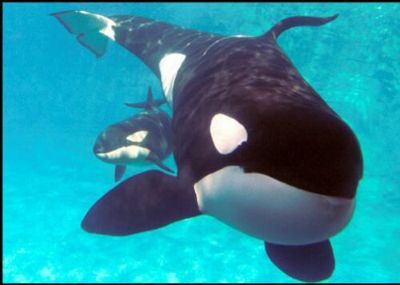 Keiko made famous in "Free Willy" movies, died at the age of 27 of pneumonia. For more information, click here. 26/10/03 - The female Orca, captured in Russia on the 1st of October 2003, has passed away on this day. The cause of her death is not known, the death does not cume surprisingly, as the mortality rate amongst the newly captured ceteaceans is rather high. More more information, click here.